It's perfectly fine to just cut a nice piece of cloth and lay it on the floor of your dollhouse, but because I am constantly moving the furniture around, I thought a sturdier rug would be easier to move and position. I like using rubber 'mats' under the rugs in my own house to keep them from slipping around. 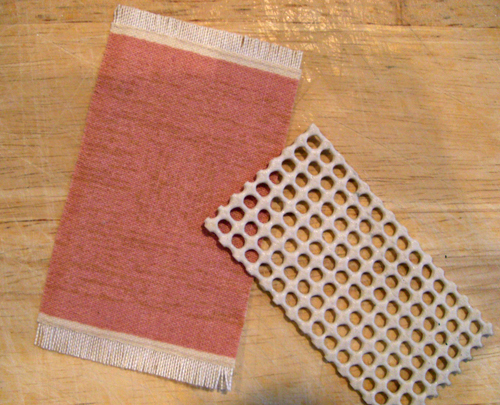 I cut a small remnant and glued it to the back of my rug as shown in the picture. 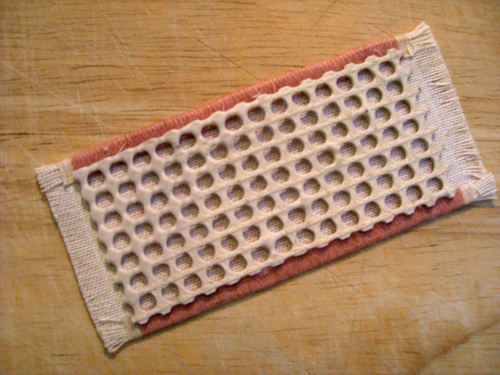 You could also use a piece of a rubber mat they sell for kitchen cupboards (to put under your drinking glasses, etc). The result is a nice, sturdy looking rug that is easy to pick up and move around the room, and it won't slide around or roll up at the edges. My cloth is medium thick fabric that had big squares of different colours. That's how I got the light coloured fringe. You can get a perfect fringe by pulling one thread out and cutting along the line that is left by the thread. You then pull out as many threads as you want to get the fringe the way you like it. 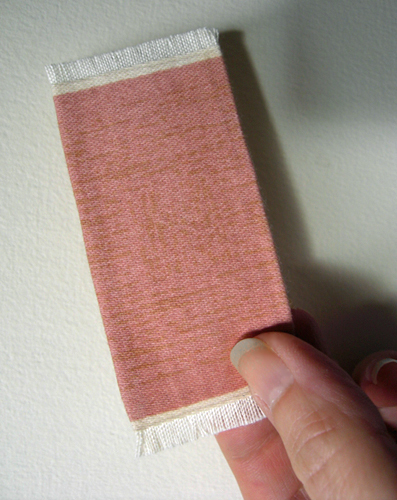 I then ironed over the un-fringed edges and glued them down.